My daughter discovered her artistic talent in middle school. She used the Microsoft Paint program to create some really cool, sophisticated drawings. When it came time for high school, she applied to the Baltimore School for the Arts. It's a very competitive school — you have to audition. Her portfolio looked great, and I really thought the fact that she worked so well with a digital medium would be to her advantage. It wasn't. She didn't get accepted. And I got weepy when I broke the bad news. There is nothing worse than seeing your firstborn get such a big disappointment. But things often turn out for the best. In a little over a month, my baby girl will be off to University of Maryland Baltimore County (UMBC). And she's already declared a major: Bioinformatics. Pretty cool stuff. It will definitely incorporate her math and artistic skills. And the average entry-level salary is $95K. My girl. Now, she didn't pick this major solely because of that salary. But you better believe it was a factor. Because my daughter “gets it.” She appreciates the necessity to do something you love for a career. And she also understands what financial well-being will mean for her life. And I'll tell you, for a while there, after the financial crisis, I was very concerned about what the job market would look like when she was entering it. As a family, we talked a lot about how the U.S. economy has changed from what it was when I entered the job market as a 30-year-old, after a couple years as a ski bum and several years as a rock star wannabe. Maybe I was a lunatic, but I never doubted that I would be able to find my way. I don't worry about economic opportunity so much anymore. The U.S. economy has evolved from where it was 10 years ago, and I think “these kids today” have some pretty good prospects. Last week, I came across a great article from Bloomberg. 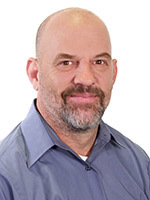 Assistant professor of finance at Stony Brook University, Noah Smith, took on immigration to the U.S. from Mexico. The Mexican-born population in the U.S. -- including both those who came legally and those who came illegally -- peaked in 2007 at about 12.75 million, and has since fallen by about 700,000... The number of unauthorized Mexican immigrants has fallen even more, by 1.1 million. 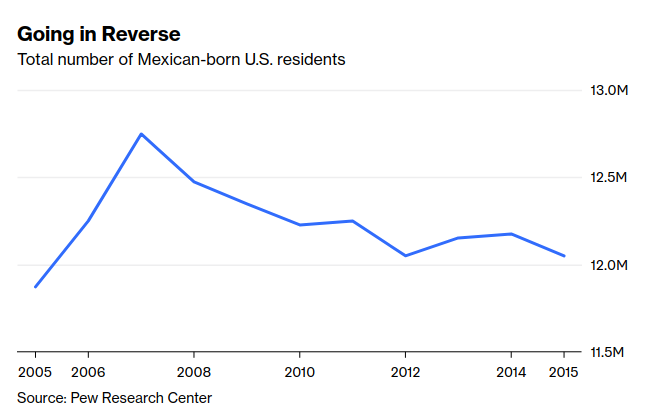 In other words, during the past decade, the U.S. has seen a large number of unauthorized Mexicans return home, and a modest number of Mexicans come in through legal channels, leading to a net decline. I'm sure a lot of Americans won't believe this. After all, we have an immigration crisis, right? My point here is not to argue whether Mexican immigration has already peaked. Numbers are numbers, and there's no point in saying they don't mean what they mean. I'm also not going to argue about the makeup of illegal immigrants. Yes, it is true that more are coming from Honduras, El Salvador (where that MS-13 gang is from), and Guatemala. Mexico’s economy has grown robustly -- the country’s per capita gross domestic product, valued at purchasing power parity, is now about $19,500, higher than China’s. Mexico’s fertility rate has also fallen to 2.24 children per woman, just slightly more than the replacement rate of 2.1 -- that means people need to stay home to take care of aging parents and take over family businesses, instead of going north to work. People have always come to the U.S. seeking more opportunity, a better life. And America has had more opportunity, that better life, because of three things: rule of law, free trade, and capitalism. Join Wealth Daily today for FREE. We'll keep you on top of all the hottest investment ideas before they hit Wall Street. Become a member today, and get our latest free report: "How to Make Your Fortune in Stocks"
It contains full details on why dividends are an amazing tool for growing your wealth. Around the globe, fewer people than ever live in poverty. Infant mortality rates are lower than ever. Life spans are longer than ever. Literacy rates are higher than ever. Simply put, the world is a better place, and this is due to capitalism and free trade. Now, some will surely say that the U.S. has lost a step as the rest of the world has taken a step forward. In other words, they took our jobs. And there is some truth to this. There's no doubt that having some cars and car parts made in Mexico by Mexicans mean they aren't made here by Americans. I am completely fine with this. The average pay for a U.S. autoworker is about $16 an hour. That works out to about $30K a year. The median income in the U.S. is now $56K a year. Bottom line: Work on an auto assembly line is kind of a crappy job. And that's exactly how capitalism works. Capitalism means change. It means evolution. It means out with the old and in with the new. Like, as more automation comes into an auto plant, it necessarily means that human labor is devalued. I get why that's hard for people to accept. Nobody wants to be devalued and replaced by a machine. Instead of lamenting that building cars can no longer support a middle class, why not recognize that there are better jobs building and maintaining those robots? Why lament that coal jobs are disappearing? Why not tell people the truth: that capitalism has discovered better and cheaper ways to generate electricity? OK, I've thought about this, and I know it's going to tick off some people. I'm sure I will get hate mail. But I'm going to do it anyway. Here's a video of Sam Kinison's classic routine about world hunger. Social mobility in this country is at an all-time low. Americans don't move where the jobs are as much as we used to. People don't seek out training. My daughter has already figured out that if she wants it, she has to go get it. How hard can it be? U.S. Military Declares War on D.C.